A detail of "Surrender Everything"
The largest piece in the current show I have at University of Portland is a work I’ve been plugging away on for some time entitled, “Surrender Everything.” For the work, I wanted to create sculptural figures that were a bit more dominant than they can often be in my work. I was pleased with the results. It took some negotiating as to how to piece it together, but through a lot of screws, and deciding to bolt the figures to the base, we had success. If you look at an earlier post I wrote on St. Jerome you can see a painting that has the lion I based mine on for this work, along with one of the images of Jerome I was looking at to create the large wooden figure. The lion is a development of the gouache and watercolor images I have been doing smaller over the years that I would also create temporary versions of on gallery walls. I wondered what would happen if I actually made a illuminated manuscript type figure large, that is actually a physical part of the piece. He very much “speaks his mind” in the work visually, and I like how he references too the folk tradition of wooden cut outs. Hope your Sunday is going well. Hope to see you at the closing reception a week from Thursday (the 3rd) at University of Portland (from 5-7). 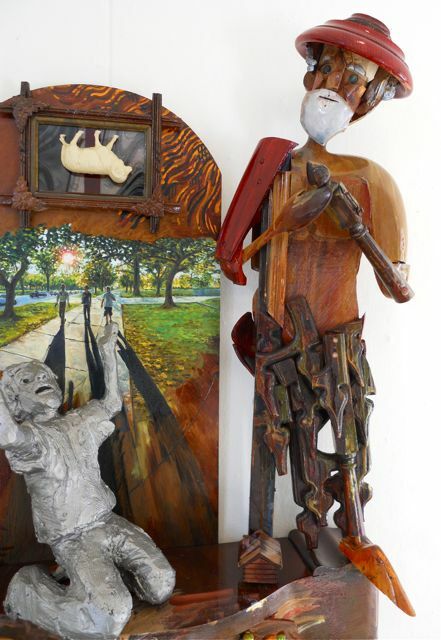 Tim Timmerman, "Surrender Everything" oil on wood, found objects, glass, cast glass, and plaster. Approximately 3 1/2'x 5' (click image to see image larger). 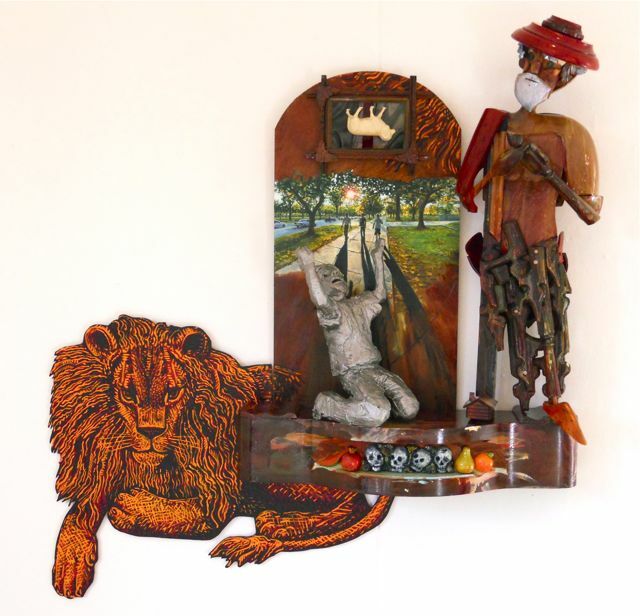 This entry was posted in Art in the Works and tagged art and faith, assemblage, faith in art, folk art, oil painting, St. Jerome, surrender everything. Bookmark the permalink. Hi Tim! I thought this show was at Univ of Portland? I want to make sure we show up at the right place next Thursday. Looking forward to seeing it! It is at University of Portland- whoops!